You may remember that back in the Spring a friend of ours, Jack Broomall, took his GS and rode it from Philadelphia to Anchorage, AK and back, solo. We dubbed the trip RevZilla to Wasilla and it lasted over a month and helped him raise some awareness through our blog and other channels. Jack took pictured and blogged it the whole way. The purpose - besides personal enlightenment - was to raise awareness and money for the Austin Hatcher Foundation. Jack's journey came and went and overall was a triumphant endeavor. But he has been sitting on a mountain of pictures and stories which are right up the alley of the Adventure Motorcycle riding crew which makes up so much of our loyal customer base and riding community - so why not bring him in to share in person! Naturally when we decided to do an Adventure Touring / Sport Touring Focused Fall Open house, it made total sense to ask Jack if he wouldn't mind coming to show some pics, tell some tales and answer some questions about his ride. Although our off-season Saturday hours are in full effect since mid September (Saturday fittings by appointment only) - we will be open from 12pm to 4pm on October 17th, 2009 at our Philadelphia Store. Our plan is for Jack to start his adventure story time around 2pm. Please don't hesitate to come by or ride in. there will be plenty of parking out front and like minded riders to hang with. We have a thread on ADVRider.com and we are actively trying to spread the word, so any help is much appreciated. You can find out more details and directions on our Philly Store Page or you can shoot us an email if need be. 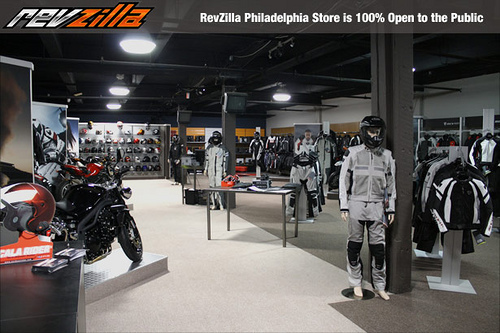 Call 877 792 9455 or email cs[at]revzilla.com with questions.